About Vital Force | Welcome to Vital Force! Our service is based on a combination of philosophy and physics. Our philosophy reflects Buddhism, Hinduism, and Christianity. One might wonder what physics has to do with philosophy, life, or business, but our life is governed by the laws of physics just as an airplane is. In fact, modern physics is considered to be derived from the ancient study of natural philosophy. Natural philosophy is the study of nature and the physical universe. Using both philosophy and physics provides us with a cohesive and whole understanding of life. We believe that once you have a basic understanding of the laws that govern your thoughts, emotions, and actions, you can skillfully guide your life toward any destination you want to reach, just as a pilot guides his plane, with surety, to its destination. One of our greatest hopes is that you will feel free to talk to us about anything on your mind without the fear of being judged. You can feel free to consult with us about your strengths, weakness, or difficulties as you would discuss your symptoms with a physician. Most of us are hesitant to discuss or even to become aware of our weaknesses. There is nothing wrong with having weaknesses; we all have strengths and weaknesses. That is how nature works. Even a magnet has positive and negative polarities. Awareness of our strengths and weaknesses is the first step toward any success. Before taking a Tylenol, you have to have an awareness of your headache. We are here to help you find solutions to your problems or difficulties. To acknowledge these problems without fear is a healthy step toward living your best life. Vital Force was founded by author and consultant, Wasantha Mohottige. Wasantha considers himself a philosopher more than anything else. 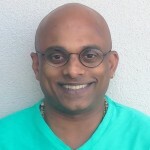 Originally from Sri Lanka, Wasantha has spent over thirty years in Santa Barbara, California, where he has been a student and entrepreneur, and where he is currently raising his family and trying to help others live their best life.